Today is Palm Sunday---the beginning of Holy Week. 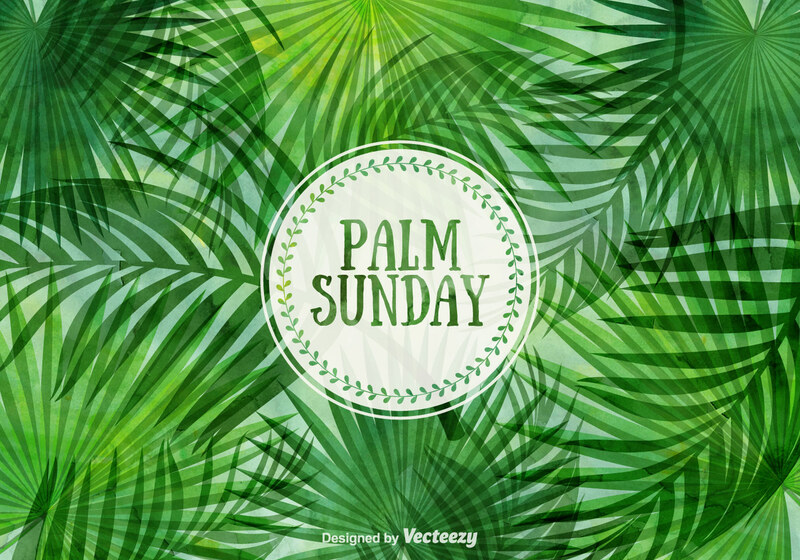 We need to read the story of how there were cheers and palm waving on Palm Sunday as Jesus entered into Jerusalem, and we also need to know that many of the same people who were shouting praises to God and lauding Jesus as he rode into Jerusalem, were screaming "Crucify him!" five days later. And lest we get all superior from the sanctimony of our historical distance... we, too, are quick to turn from praise to jeers when God's plans don't coincide with our own. Or when Jesus turns out to be the exact opposite of how we've constructed him. That's a good sermon. I've preached that sermon, and I may preach the same kind of sermon again. But this year I've decided to focus on something different in the story. It's been a challenging and transforming season of Lent, and I feel like it's time for some encouragement. Which is why I am going to be preaching about the donkey Jesus rode into Jerusalem. You have an important role to play in God's great big salvation story. We need a little "back story" to get us up to speed on what is happening here. First, Jesus was "going up to Jerusalem." Jesus had a purpose and a direction. He knew that Jerusalem was where his bitterest enemies had the most power. He knew they wanted to kill him. Yet he went there. The passages leading up to the one we just read show Jesus slowly making his way to the Holy City to arrive in time for Passover. His disciples tried to dissuade him, but to no avail. The towns of Bethphage and Bethany were right next to each other outside of Jerusalem on the other side of the Mt. of Olives. Bethphage means "House of Unripe Figs," and Bethany means "House of Figs." It must have been a bummer to live where the figs were unripe as opposed to where the figs were just right. Bethany was the home of Mary, Martha and Lazarus, the friend whom Jesus raised from the dead. This was familiar and somewhat friendly territory for Jesus---unlike where he was heading. As Jesus and his disciples approached Bethany, he tells his disciples to go into town and "jack" a donkey. "Jack" is slang for "steal." It's my vain attempt at seeming relevant in my street speech. #fail. So, Jesus tells his disciples to go into town, where they will find a donkey. They are to take the donkey, and if anyone tries to stop them they are to say "The Lord needs it." I have a question: "Is it stealing if Jesus tells you to do it?" And not the Jesus who speaks to you when you've taken too much Nyquil, but the real Jesus. That's a little too deep for our purposes, I'm afraid. So why did Jesus want a donkey? And why a young donkey? First, the age of the animal reflects purity. In the ancient Hebrew world, a sacrificial animal had to be one that was pure--that had not been used for any other purposes. This is highly symbolic in that Jesus wanted to demonstrate the sacrificial and holy nature of his purpose. Second, this is one of the moments when Culture and Divine Design meet. In the ancient world, there was a custom called angaria where someone of great importance, a ruler, a high ranking official could commandeer livestock or steeds for his own purposes. Jesus is invoking this sort of feeling with this moment. In 1 Kings 1:33 the great King David is nearing the end of his life and wants his son Solomon to inherit the throne. To ensure that everyone knows that Solomon is the true heir, the true king, David has him paraded into the city on his own donkey. In Zechariah 9:9 we have this verse: Rejoice greatly, Daughter Zion! Shout Daughter Jerusalem! See, your king comes to you, righteous and victorious, lowly and riding on a donkey, on a colt, the foal of a donkey. This symbol demonstrated the characteristics of an ideal king---someone who would use a lowly animal of peace, to demonstrate his goodness. The fact that they were used by David and his sons loomed large in the Hebrew cultural imagination. But still... it's a donkey. What is it with people and donkey derision? It's been going on for centuries. Read this quote from the ancient Jewish text, The Talmud: "If one man speaks to thee, 'Thou art a donkey,' pay no heed. If two speak thus, purchase a saddle." Or this gem of an ancient Turkish proverb: A worthy man is still worthy even penniless, a donkey is a donkey even if he is finely saddled." So what did Jesus do by choosing this little animal? What lesson can we take away from this that might be even deeper than the political, social and cultural meaning that the ancient Hebrew people would have experienced? Starve, scourge, deride me: I am dumb/I keep my secret still/Fools! For I also had my hour/One far fierce hour and sweet:/There was a shout about my ears/And Palms before my feet. This little donkey was part of the great plan of redemption that God had for all of Creation. When Jesus rode that little donkey into Jerusalem, he was fulfilling prophecy---all that had been spoken of the Messiah and how he would arrive came to life. He also proclaimed the kingdom of God. It was a different kind of kingdom than the Empire of Rome. It didn't depend on a revolution by violence, but one of transformation. Jesus also used that donkey to move toward Calvary and to sacrifice. The pure animal was a sign and symbol of the holiness of the moment and what Jesus was about to do for all of humankind. Lastly, Jesus used that donkey to take one more step toward saving the world. And the line that starts this whole chain of events in motion is my favorite from the passage: "The Lord Needs It..."
What if that was said of you? What if you heard those words: "The Lord Needs You?" What would you say in response? Would you believe it? I suspect that most of us Christians walk around believing that we are less than, that God doesn't really have anything special in mind for us. Like a lot of people we live lives of quiet desperation, missing out on the great blessings and grand story that God has in store for us. We might respond to God's call by saying, "I am too... old, young, poor, tired, sinful, busy, overwhelmed..."
We might respond by asking, "Why would God say that I am needed when he doesn't seem to be present in my life?" or "Why would God want to use someone like me?" We might respond by asking further, "Why not someone else who is... holier, better, kinder, better looking, younger, older, richer, more successful...?" And yet, deep inside we long for more. We long to be part of God's great plan. We long to be valued. We long to be wanted and loved. I read the story of a young woman named Tanya Kach, who was kidnapped by a demented older man when she was a middle schooler. The man kept her prisoner for ten years---constantly telling her that her family didn't want her, that they didn't love her, that he was the only who truly cared for her. He thought that he had so brainwashed Tanya that he let her go out of the house to the store and the mall by herself. She gathered her courage one day and went to a police officer and told him her story. After she was reunited with her family, she wanted to know why her father had not wanted her, or tried to find her. He was able to tell her at last that he never stopped searching for her, that he longed for her, and never gave up hope that he would see her again. So many of us have believed the lies of the Enemy for so long that we can't even imagine the truth about God's love for us. You are invaluable to God's plans. God has great plans for you and for the world, and you are an integral part of those plans. God's will is going to get done with or without you. But God desires that you fulfill your invaluable role. You have a kingdom purpose. Your mission, your calling, your part in the Big Story of Salvation is that God desires you, needs you to be part of the kingdom work that is happening right now to declare that Jesus kingdom will be fully revealed in all it's glory one day. You are worth far more than you can know. Despite the fact that you may have believed the lies of the Enemy about your worth, God has never stopped desiring you, never stopped searching for you, never stopped wanting you. God sacrificed everything to save you. You are worth more in the eyes of God than anything you could imagine. If God can use even the most humble and lowly creature for his great glory, how might he use you if you are willing? So may you go into the world with the knowledge that God has plans for you that are not meant to harm you but to give you hope and a future. May you go in the knowledge that you are worth the greatest sacrifice that God could make in order to secure your release from sin and death. May you go knowing that you are invaluable and that your purpose is great and grand, just like the great Story of Salvation that claimed you.